I don’t often make dessert because my children are, for some strange reason, not very fond of desserts. I am normally forced to eat most of it! There is however some desserts that they cannot resist. Among them Chocolate fondant pudding, Malva pudding and Apricot jam pudding. 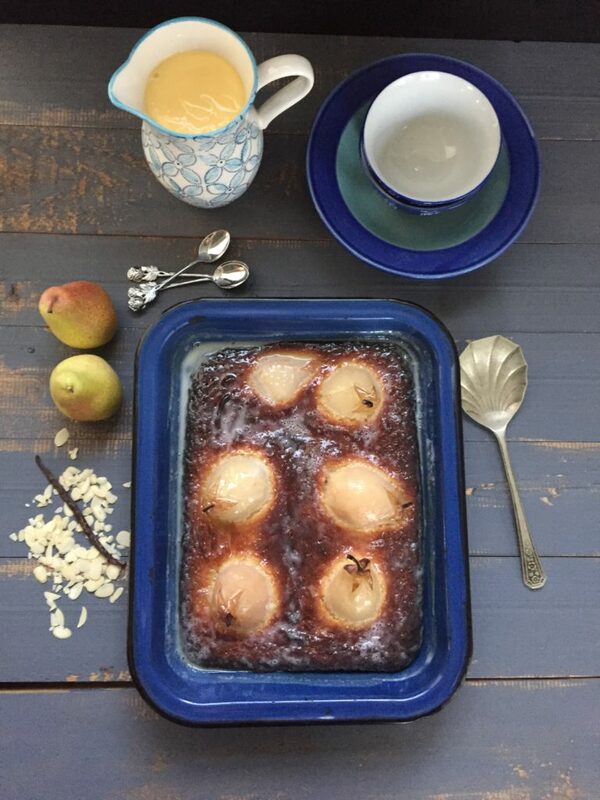 According to my family this Pear and Almond Pudding rates very high on the list for their favourite desserts. I also made it for a Sunday lunch with friends and they also loved it. 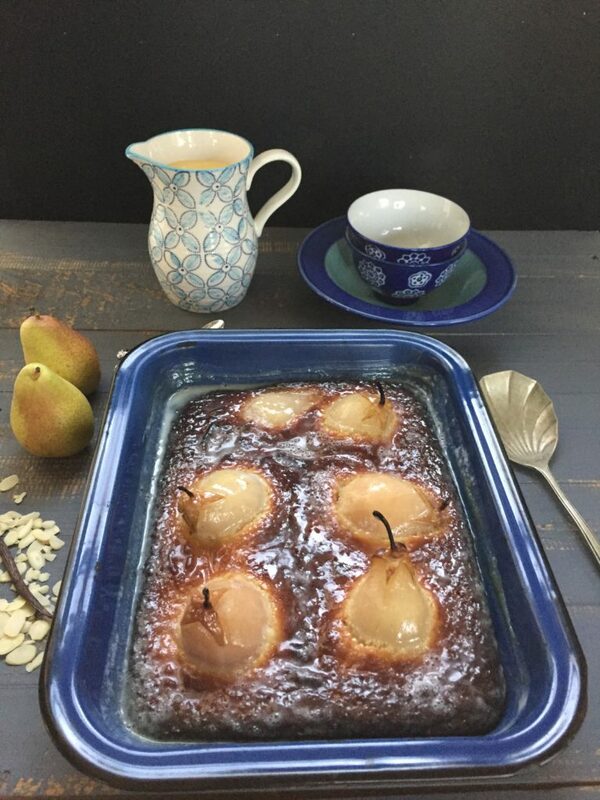 Preparation of this dessert takes a bit of time, since you have to peal and poach the fresh pears but it is definitely worth every minute. I scored a zigzag pattern around the stalk of each pear and left the skin on in this area. Peel the pears very thinly to retain the shape of the pears and remove the core from the bottom. While almond meal can be quite expensive, just keep your eyes open for specials, which appear often. I suggest stocking up on this delicious ingredient whenever you can get it at a reduced price, as it keeps well in the fridge in a sealed container. This pudding is great served warm with cream or custard. While it tastes equally great cold, I suggest that you eat it almost straight from the oven in this winter weather! Peel and core the pears. Slice a piece from the bottom in order to balance the pears upright in the dessert. Place the water and vanilla pod in a saucepan and bring to the boil. 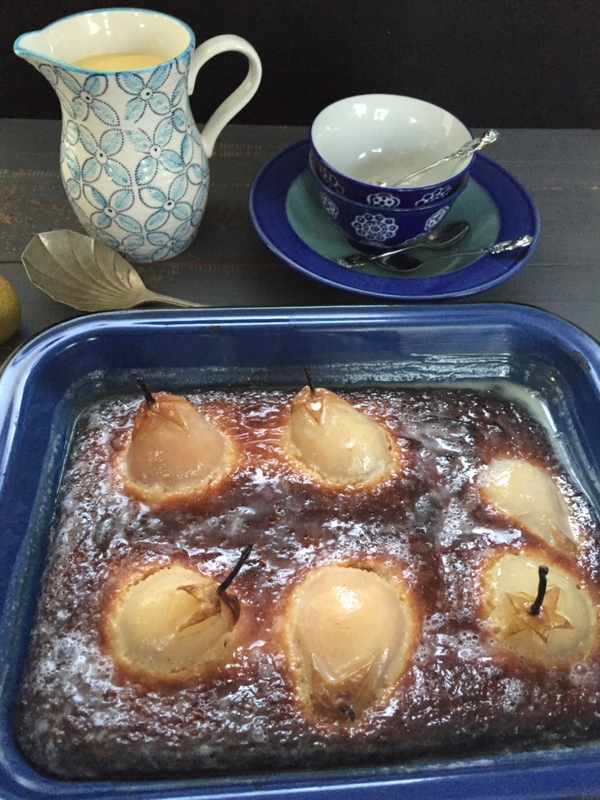 Add the pears and simmer on a low heat for approximately 20 minutes or until the pears are soft. Pre-heat the oven to 180⁰C and butter a square ovenproof dish. Add the eggs, one at a time and beat thoroughly before adding the next egg. Add the almond meal, baking powder and salt and mix until combined. 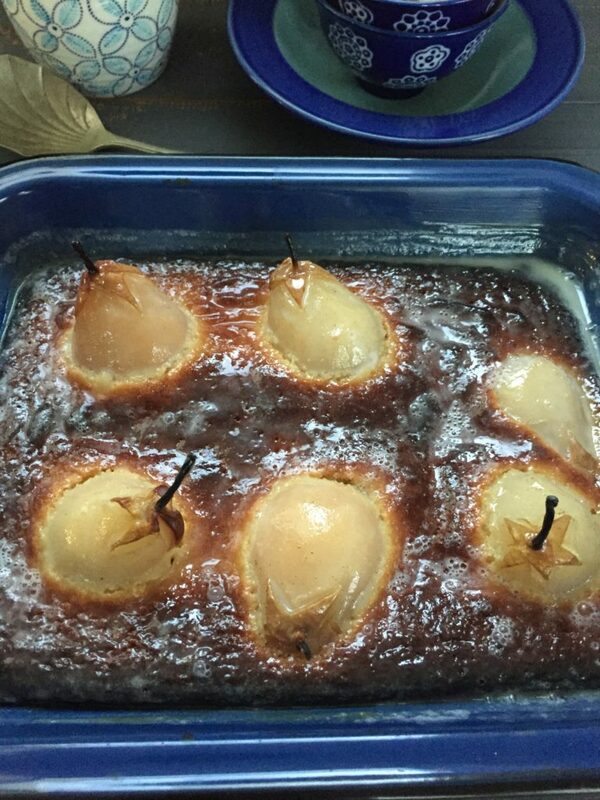 Pour the batter into the prepared dish and place the pears upright into the batter. Bake the pudding for approximately 25 minutes or until baked through in the pre-heated oven. Mix the cream and sugar together in a small saucepan. Whilst the pudding is in the oven heat the cream and sugar on the stovetop and stir continuously until all the sugar has dissolved. Pour over the pudding as soon as it is removed from the oven. It looks a goodly pud. Not liking desserts? Your offspring are seriously strange!